Christy Mathewson was major league baseball's first pitching superstar and is still the winningest pitcher for the National League. While many players at the time were known for their wild lifestyles, Mathewson was a model for moral behavior and an inspiration for many fans. This list highlights the top Christy Mathewson baseball cards from his playing days, including his appearances in the famous T205 and T206 sets. 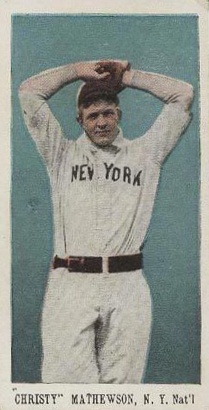 Mathewson spent nearly his entire career with the New York Giants, pitching 17 seasons with the team. He debuted in 1900 and by the next season, he was already a 20-game winner. A devout Christian, Mathewson would never pitch on a Sunday, earning him the nickname of "The Christian Gentleman." Shop for Professionally Graded Christy Mathewson Cards on eBay. Thirteen pitchers have recorded 30-plus wins in a single season during the 20th century and no pitcher did it more often than Mathewson. He accomplished the feat four times over his career and, from 1903-1905, he did it three consecutive seasons. His 1905 and 1908 seasons stand out the most as he won the pitching Triple Crown by leading the league in wins, ERA, and strikeouts. In 1908, Mathewson was an outstanding 37-11 with a jaw-dropping 1.43 ERA, and he added an amazing 34 complete games. 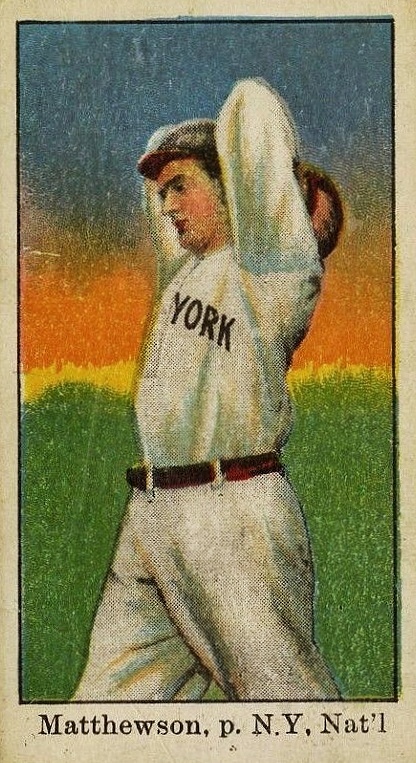 Not just limited to individual accolades, Christy Mathewson helped bring six National League pennants to the New York Giants and a World Series victory in 1905, the franchise's first championship. His performance in the 1905 World Series was possibly the greatest in MLB history as Christy threw complete-game shutouts in Game 1, Game 3, and Game 5 wins over the Philadelphia A's. Mathewson joined the U.S. Army toward the end of World War I and, during training in Europe, he was accidentally exposed to chemicals that severely damaged his lungs. The rest of his life would be a battle against health problems and Christy died of tuberculosis in 1925 at the age of 45. He was posthumously elected to the Baseball Hall of Fame's inaugural class in 1936 and, along with Walter Johnson, became the first pitchers selected. The cards in this top list are all from the tobacco era and Mathewson's playing days, putting them out of reach for many collectors. While his key cards will nearly always command strong values, there are several modern appearances that are available to collectors with more modest budgets. Mathewson was included in the first Topps product ever issued, 1948 Topps Magic Photos. The cards appeared blank when pulled from the pack but after adding a little water (or, more likely, a little spit) and holding it up to a light, the picture of the player would appear. Mathewson was also included in the 1951 Topps Connie Mack's All-Star set that featured the best player at each position according to the legendary coach. Another Mathewson card of note was in the 1967 Topps Venezuelan Retirado set, which was created by Topps for the Venezuelan market and featured bright colors and the greatest retired players in baseball history. Because the average price for graded copies of the cards on this Christy Mathewson list frequently cross into the thousands of dollars, factors like historical importance and availability to collectors were incorporated into assigning rankings to each selection. Click on the titles or images to shop for specific cards on eBay. When available, linked sets in the descriptions go directly to detailed product profiles. 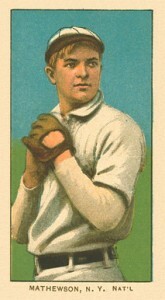 The 1912 Hassan Triple Folders cards were a unique baseball card creation in that it combined two painted portraits with an action photograph sandwiched in between. 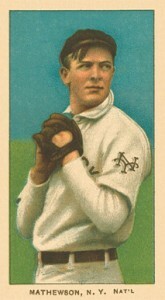 Mathewson was included in several different cards in the set, including the card below with his Giants teammate Art Devlin. Many of the photographs included in the set do not relate to the player cards surrounding it, but in this case, that is actually Devlin tagging out the runner trying to steal a base. The unnumbered cards are often organized by the title given to the photograph and this card is known as "Devlin Gets His Man." The American Caramel Company issued many different sets in 1909 and this particular design has become known as E90-1. The back of the card has an advertisement for the company's product, Baseball Caramels, into which the cards were inserted. 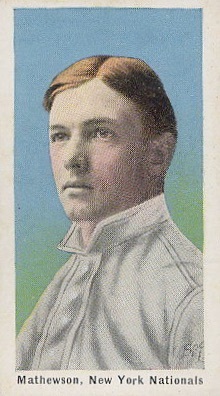 Mathewson's card features one of the most common typographical errors from cards of his day, spelling Christy's last name with two "t"s rather than just one. Mathewson's card also features a multi-colored sunset that makes it one of most beautiful cards from the set. It is hard to believe more than a century after the cards in the E98 "Set of 30" were issued that it still remains a mystery as to who exactly created them. The cards themselves have no advertising and instead the reverse side has a checklist of the 30 players featured in the set. 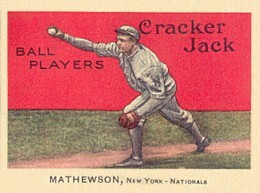 Mathewson's card showcases him about to begin his windup and cards can feature backgrounds that are blue (shown below), red, green, and orange. A huge collection of mint condition red background cards were discovered in 2012 and they were given the nickname of the "Black Swamp Find." Subscribers to Sporting Life magazine were able to get these tobacco cards that came in groups of 12 for four cents a group. Nearly 300 cards and variations were issued over the two years that the M116 set was available. 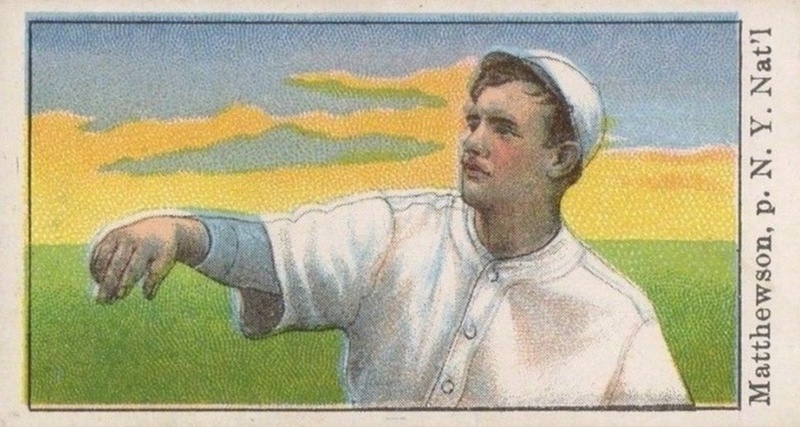 Mathewson has one of those rare variations as he has both a blue background (featured on the left) and a pastel background (pictured on the right). 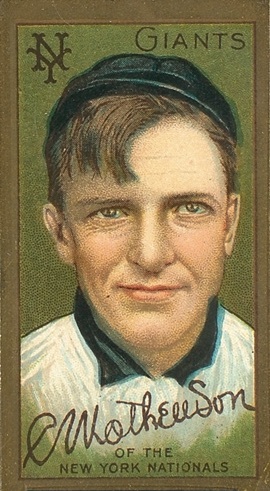 It is thought that the rare blue background was used in a second printing of the first set, which included Mathewson's pastel background card, and sold out quickly. Similar to the "Set of 30" card featured at #8 on this list, the creator of this Mathewson card is also unclear. Because of the 25 cards featured, this set has been dubbed the "Set of 25" and the backs have a complete checklist as well. 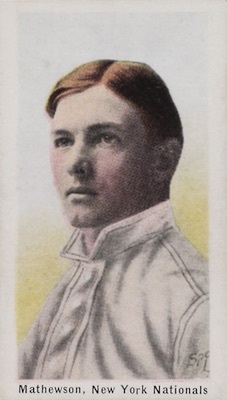 Mathewson's horizontal card featuring a cloudy sunset in the background has a value that is only outpaced in the set by cards for Honus Wagner and Ty Cobb. Mathewson, whose name is again misspelled as "Matthewson" on his 1911 T201 Mecca Double Folders card, shares space with his New York Giants teammate, and Giants shortstop, Al Bridwell. Bridwell's card, which could be folded over on top of Mathewson's to create a second card, features a great view of his fielding glove. The gloves at the time covered each finger individually with no webbing between the fingers and offered little to no padding compared to modern gloves. The initial 50 cards (including Mathewson's card #27) of the 1910-1911 Turkey Red cabinet set were produced in early 1910. There are two known reverse side checklist variations for Mathewson's card as one has ordering information for more cabinet cards and the other does not feature that ordering information. Collectors have come to find that the lesser names on the Turkey Red checklist are much more difficult to locate as it seems stars were preserved more often than common players. 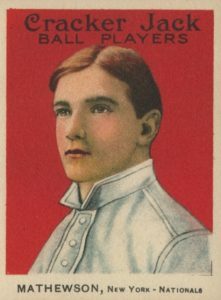 Many players featured in both the 1914 and 1915 Cracker Jack sets were often given the same card with changes done only on the card backs. 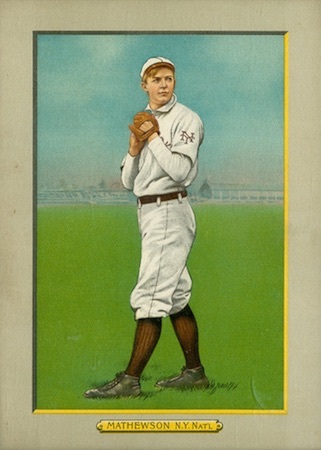 Mathewson's two cards couldn't be more different, however, as he is seen about to deliver a pitch on a horizontally framed card from the 1914 set, and is shown on a portrait image from 1915. Collectors have placed a steep premium on the 1914 action card as only a few have survived in pristine condition. It is worth pointing out that Cracker Jack themselves have said more than 10,000,000 total cards were produced. The 1911 T205 set differentiates between the players from the American and National Leagues by the design. American League player portraits are placed in the middle of a baseball diamond while National League players (including Mathewson) were given a larger portrait card. Fairly recently, a Mathewson statistical variation of his T205 card has been discovered that shows he was 37-1 rather than the correct 37-11 during the 1908 season. This error has only been found on the rare Cycle Cigarettes back and not on the much more common Sweet Caporal and Piedmont backs. Mathewson has two cards and a variation in the most popular and valuable set from the tobacco card era, the famed T206. His portrait card featuring a red and orange background has proven to be the most popular with collectors and one of the rarest cards to find in an above-average condition in the entire set. The two cards that feature Mathewson with his glove on his chest look very similar, but upon closer examination, you will note they are two separate paintings all together. 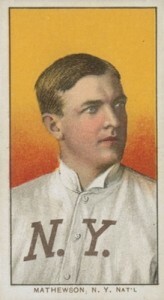 Besides the difference in the white and black caps, the dark cap version also includes the New York Giants logo and the team name across Mathewson's chest. Overall, it is the white cap variation that is the rarest card to find amongst his three T206 appearances. 2014 Panini America Christy Mathewson 1936 Hall of Fame Pitcher 38 75 Only! 1912 T202 HASSAN CHRISTY MATHEWSON PARTIALLY PRINTED BACK RARE OR ONE OF A KIND?